Recently we had a chance to spend some time in the all-new Audi A4, Audi’s volume leader and the car that turned the brand into the juggernaut it is today. Which, if you follow any car news, had its 63rd consecutive sales record in a row, with sales for March 2016 at 18,392 vehicles sold, an increase of 7.5 percent over the same 2015 period and with a year-to-date sales increased 4.6 percent with 41,960 vehicles sold in the first quarter of 2016. That’s huge and it all comes down to some seriously great, all-new product the brand has pushing. In the last six months along, there was an all new R8, A4 and Q7, with a lot more to come. Audi sales have more-than doubled over the past six years to a record 202,202 deliveries in 2015, up from from 82,716 automobiles sold in 2009. Which, when you think of it, is kind of crazy as Audis aren’t priced like a bare-bones Toyota Camry. Audi’s decade long renaissance has placed the company in the same category as BMW and Mercedes-Benz as a leader in the luxury segment and, while some may argue that this renaissance began with the R8 supercar in 2008, a more realistic beginning occurred with the introduction of the last A4 in 2009. With its characteristic R8-mimicking LED daytime running lights that have now made their way into almost every modern car, the A4 provided all-wheel-drive luxury in a handsome package, both inside and out. 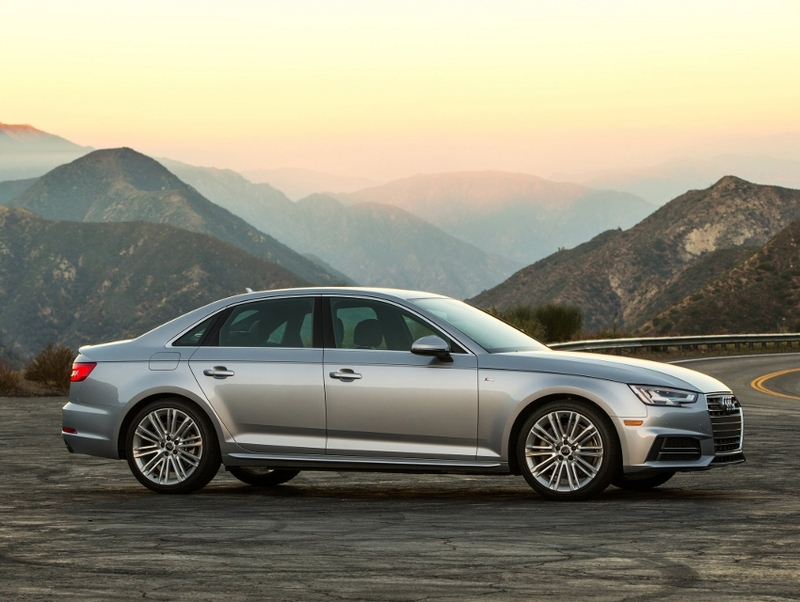 Now, for 2017, Audi has redesigned the ninth-generation A4 to provide more of the same successful formula. The entry-level luxury segment has always been competitive, and with entrants like the ubiquitous BMW 3-series, reborn Mercedes C-class, and the highly anticipated new Jaguar XE, the new A4 has a lot to live up to. In redesigning the new A4, Audi rightfully began with the chassis, using aluminum components to reduce weight up to 100-lbs despite being longer and wider than the outgoing car. Meanwhile, the updated 2.0-liter turbocharged four now makes 248hp and 273 lb-ft of torque and is mated to an excellent crisp-shifting seven-speed S Tronic dual cloth automatic. With these improvements, the A4 can accelerate to 60 mph in 5.6 seconds and, from the time we spent in the car, undoubtedly performs better on a twisty road than in a straight line, especially with Audi’s Drive Select program that adjusts steering, suspension, and throttle, and in the sportiest Dynamic setting, the new A4 feels especially responsive and stable, with significantly less understeer than its predecessor. The new A4’s exterior styling follows the familiar modern Audi recipe of clean, minimalistic, and understated design, which seems to be the opposite to Mercedes-Benz. Think of it like this, Audi is for the Bottega Veneta buyer, while Benz is for the Louis Vuitton buyer—both make great products to lust for but each has their own values and branding. While some may not be able to tell the new car from the old one, despite it being 90 percent new, the exterior is a case of if “it ain’t broke, let’s not futz with it too much.” However, the 2017 A4’s interior tells a much different story. The new model sees a drastic improvement over the old car in both luxury and technology, catapulting the new car to share best-in-class interior with Mercedes’s gorgeous new C-class. The A4’s materials are top-notch, with lovely leather featuring contrast stitching and piping, a beautiful matte wood trim and soft-touch materials throughout the cabin. But the highlight of the new A4’s cabin is optional Virtual Cockpit already seen in the TT, Q7, and R8. The entire dashboard consists of one big 12.3-inch high-resolution screen that can be reconfigured to display any of the car’s functions—you could even display a gigantic map, turning this into the most functional navigation system available today. An additional 8.3-inch screen sits on top of the dash, should you need to display other functions too. Audi rethought the entire user experience even down the color of the lighting and iconography on the climate control system. Overall, the new 2017 Audi A4 is a significant improvement over the old car while maintaining a similar recipe that made the outgoing model so successful. It’s luxurious, brimming with technology, and understated, while delivering solid performance and all-wheel-drive versatility. For its intended market, the new A4—starting at a very competitive $37,300—re-enters the fray as a serious contender in the luxury market. Jon Alain Guzik is the luxury car columnist for Los Angeles magazine. He is the founder of PrazoCars.com and when he was child had a poster of an early-80s Audi Quattro rally car on his bedroom wall.